This Unicorn Horn is surprisingly easy to make! 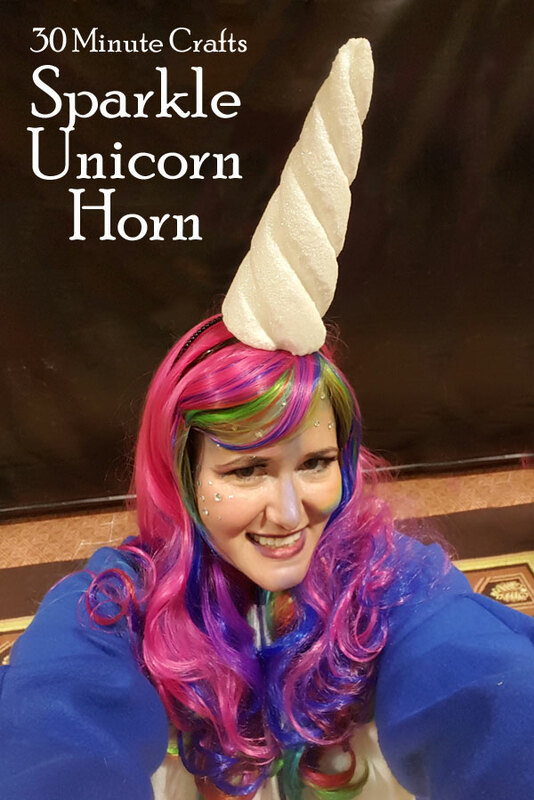 I made this Unicorn Horn in about 20 minutes – depending on how big of a perfectionist you are, you should be able to make your own Unicorn Horn in under 30 minutes. Then let it dry overnight, and you’re ready to wear a beautiful and sparkly Unicorn Horn! When the folks at Plaid (the makers of Mod Podge) asked me to share a fun craft for the 50th Anniversary Celebration of Mod Podge, I knew I wanted to share this Unicorn Horn. The sparkly glitter on this Unicorn Horn is made by mixing together Mod Podge and small iridescent glitter flakes until it is almost paste-like. Mixing glitter in Mod Podge is my absolute favorite way to use glitter – it makes almost no mess, and there is very little wasted glitter! Any glitter you get on your hands peels right off when the Mod Podge is dry. Watch the video to see how it is done. I have detailed written instructions below if you’d rather follow written instructions. Use the Styrofoam sculpting tool’s pointy end to carve a swirl into the horn. Mark notches at the top splitting it into thirds. Carve swirls into each of these thirds. Use the thick end of the sculpting tool make the swirls deeper. With your fingers, curve the sides of the swirls to make the horn look very natural. Carve two notches into the bottom of the horn to match up with the headband. Cut 4 pieces of wire, each about 5″ long. Bend each into a “U” shape. With hot glue, secure the headbands in place. Push the pointy ends of the U-wires on either side of the headbands to secure the headbands in place. Mix Mod Podge and glitter to make a paste consistency. Paint onto horn to coat. Truly magical! Yes, you are! You were the best unicorn at the party. Thank you for the joy you bring to all who meet you. Your creativity makes you sparkle for inside out. Just like a unicorn.